Simple and elegant – that is the Zürich. Top models from this collection of automatic watches feature a world time function, which displays 24 time zones at once. 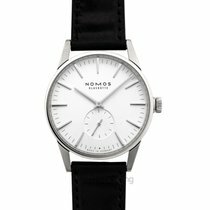 The Bauhaus-inspired design is linear and minimalist, as is typical of NOMOS watches. 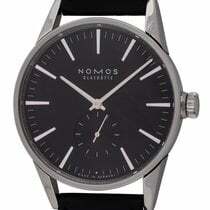 The watch manufacturer NOMOS is based in the small Saxon town of Glashütte. They're famous for their simple and elegant designs inspired by the Bauhaus movement of the 1920s, as demonstrated in their use of small, flat cases. Despite being more masculine and on the large side, the Zürich still feels restrained. Its complications make the Zürich World Time this German manufacturer's most mechanically sophisticated watch. However, the three-hand models with no world time display are just as impressive thanks to their timeless looks and precise movements. NOMOS exclusively equips their watches with in-house calibers and produces up to 95% of each movement themselves. Renowned Swiss designer Hannes Wettstein designed this watch's case. He had previously designed watches for the Swiss brand Ventura. The Zürich would be Wettstein's final design, as he passed away in 2008 after a long battle with cancer. His legacy lives on in the aura that surrounds both versions of the Zürich. Every Zürich has a galvanized brown gold, anthracite, dark blue, or white silver-plated dial. Three-hand models come in all four varieties, while world time watches are only available in the latter two. 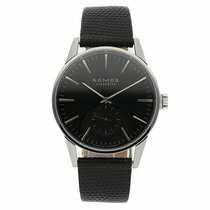 NOMOS constructs their straps using cordovan leather, which is extremely robust. The cases are all made of stainless steel with a steel or sapphire glass case back. How much does a Zürich cost? The classic 40-mm model with a white dial and no world time display marks the entry point into this collection. As always, the small seconds dial sits at 6 o'clock. 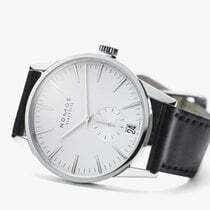 You can call this NOMOS watch your own for around 2,800 USD. Timepieces in this price range are in mint condition and feature a stainless steel case back. If you prefer to view the automatic movement at work, the same model with a sapphire glass case back costs about 120 USD more. NOMOS calibers are a sight to behold, as each is a prime example of this Glashütte-based manufacturer's craftsmanship. Tempered blue screws, engraving, and decorative finishes make these refined calibers true masterpieces. You can purchase a Zürich with a brown gold or anthracite dial for around 3,200 USD. These dark colors contrast beautifully with the stainless steel cases and pair nicely with evening wear in similar colors. The models also offer a view of the Epsilon movement through a sapphire glass case back. The NOMOS Zürich with a date below the small seconds at 6 o'clock features a white silver-plated dial and feels very tidy. This dress watch sells for about 3,400 USD. The Zürich World Time is the perfect companion for any frequent traveler. By pressing the push-piece at 2 o'clock, you can see what time it is in 24 different time zones. Each time zone is distinguished by a city name, such as London, Dubai, or Sydney, while a disc at 3 o'clock displays a second time zone. However, like every NOMOS watch, less is more, and this Zürich World Time still feels minimalist despite its complexity. A lack of indices further emphasizes its Bauhaus-inspired aesthetic. As always, the small seconds dial occupies its position at 6 o'clock. 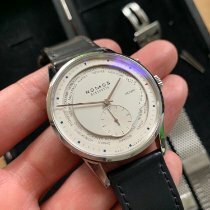 A new NOMOS Zürich World Time demands around 4,000 USD with a white dial. With a midnight blue dial, that price climbs to about 4,300 USD.A Second Time Zone: The Tangomat GMTNOMOS expanded its range and inched toward more classic watch design with the Zürich collection. However, if you prefer the look of the Tangente and are on the market for a GMT watch, it's worth taking a look at the Tangomat GMT. Despite using the same movement as the Zürich World Time, its dial is completely different. The NOMOS Tangomat GMT utilizes windows to display abbreviated city names at 9 and a second time zone at 3 o'clock. Arabic numerals complete the look and unmistakably link the watch to the Tangente. Prices for this timepiece sit around 3,200 USD. The Glashütte-based manufacturer outfits each NOMOS Zürich with one of three calibers: the in-house automatic caliber Epsilon for simpler models, the Zeta movement with a date display, and the automatic caliber DUW 5201 with a world time complication. Originally known as the "Xi," the DUW 5201 earned its name with the introduction of the NOMOS Swing System. "DUW" stands for Deutsche Uhrwerke or 'German watch movements.' The Swing System is the company's in-house escapement, which is comprised of a lever, escape wheel, balance, and balance spring. Prior to 2014, NOMOS had always outsourced this component from the Swiss company Nivarox. NOMOS and the Dresden University of Technology worked together for almost seven years to develop the Swing System, thus freeing NOMOS from their dependency upon suppliers. This is quite remarkable, considering most watch manufacturers lack the ability to build their own escapements to this day.